Photo: Burlington County Courthouse, ca. 1796, corner of High and Union Streets, Mount Holly, NJ. Historic American Buildings Survey [HABS NJ-27], Nathaniel R. Ewan, Photographer March 15, 1936, memory.loc.gov, accessed April, 2012. Burlington County administrative offices are located at 49 Rancocas Road, Mount Holly, NJ 08060; phone 609-265-5000. Burlington County is the largest county in New Jersey covering 827 square miles. The land ranges 524,160 acres bordered by Mercer County from the north, Monmouth County from the northeast, Ocean County from the east, Atlantic County from the southwest, and Camden County to the west. The land extends from the Delaware River and the Great Bay on the Atlantic Ocean. The total area is 529,351 acres including 5,191 acres of water. Forty municipalities exist within the county, consisting of three cities, six boroughs, and 31 townships. The county seat is located in Mount Holly. Rich in historic lore, with a splendid system of highways, the county holds an irresistible charm to the traveler and tourist. The pine woods, sparkling with streams and lakes and filled with bird and animal life, attract many motorists. Below Chatsworth are the "Plains," unique in eastern geography, a great mass of land covered with bush-like growth of scrub-oak, pine, and laurel. While the county is principally known for its agriculture, there is considerable manufacturing, particularly along the Delaware River. Burlington County has always been one of the leading agricultural counties in the country. The largest blueberries in the world were developed and are raised here in Burlington County. The cranberry that was found growing wild when the first settlers arrived is a considerable industry. Burlington County is the second largest cranberry producing county in the United States. More Burlington County acres are devoted to farming than any other county in the state, producing sweet corn and fruit. The county runs a close second to timber land in the state. 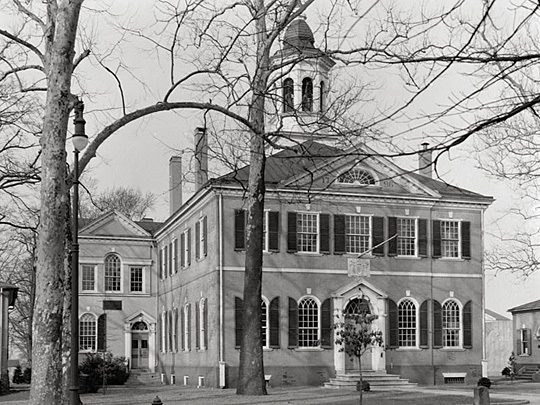 Burlington County's historic Court House in Mount Holly was built in 1796 and considered one of the finest examples of early American architecture in the country, is truly indicative of the historic lore that surrounds it. Although officially incorporated on May 17, 1694, the rudiments of county government were established with Burlington County on March 25, 1681 and were in effect before William Penn laid out the city of Philadelphia. The Lenni-Lenape Indians were the aboriginal owners of the county. In October, 1677 a group of English debarked from the ship Kent and founded the town of Burlington. The American Indians sold more and more of their lands to the new settlers until finally, in 1801, there remained less than 100 adult American Indians on the Indian Mills reservation, which was the first American Indian reservation in the United States and the American Indian's last dwelling place in Burlington County. Burlington County Historic Sketch, www.co.burlington.nj.us, accessed October, 2006.